Walter Mosley's talent knows no bounds. 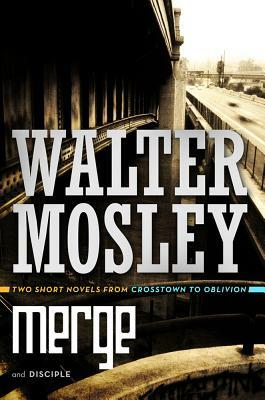 "Merge" and "Disciple "are but two of six fragments in the "Crosstown to Oblivion" short novels in which Mosley entertainingly explores life's cosmic questions. From life's meaning to the nature of good and evil, these tales take us on speculative journeys beyond the reality we have come to know. In each tale someone in our world today is given insight into these long pondered mysteries. But how would the world really receive the answers? ""Raleigh Redman loved Nicci Charbon until she left him heartbroken. Then he hit the lotto for twenty-four million dollars, quit his minimum wage job and set his sights on one goal: reading the entire collection of lectures in the Popular Educator Library, the only thing his father left behind after he died. As Raleigh is trudging through the eighth volume, he notices something in his apartment that at first seems ordinary but quickly reveals itself to be from a world very different from our own. This entity shows Raleigh joy beyond the comforts of twenty-four million dollars .and merges our world with those that live beyond. ""Hogarth "Trent" Tryman is a forty-two-year-old man working a dead-end data entry job. Though he lives alone and has no real friends besides his mother, he's grown quite content in his quiet life, burning away time with television, the internet, and video games. That all changes the night he receives a bizarre instant message on his computer from a man who calls himself Bron. At first he thinks it's a joke, but in just a matter of days Hogarth Tryman goes from a data-entry clerk to the head of a corporation. His fate is now in very powerful hands as he realizes he has become a pawn in a much larger game with unimaginable stakes a battle that threatens the prime life force on Earth. WALTER MOSLEY is one of the most versatile and admired writers in America today. He is the author of more than thirty-four critically acclaimed books, including the major bestselling mystery series featuring Easy Rawlins. His work has been translated into twenty-one languages and includes literary fiction, science fiction, political monographs, and a young adult novel. His short fiction has been widely published, and his nonfiction has appeared in "The New York Times Magazine "and "The Nation." He is the winner of numerous awards, including an O. Henry Award, a Grammy, and PEN America's Lifetime Achievement Award. He lives in New York City.